The Gray Lady's powerful eye falls on provider antitrust issues. 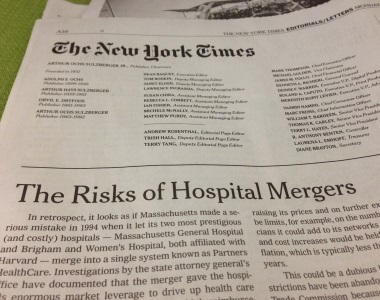 The Times editors acknowledged the potential value of new efforts to integrate care, such as accountable care organization (ACO) programs, but it noted that the 1994 merger of Massachusetts General Hospital and Brigham and Woman’s Hospital had led to higher health care prices and possible threats to some patients’ ability to use the hospital of their choice. “That way, patients would retain access to a top-flight hospital and probably pay lower premiums if their insurers bargained hard with the separate hospitals,” the editors wrote. America’s Health Insurance Plans (AHIP) e-mailed the editorial to the media. Brendan Buck, AHIP’s vice president of communications, said in a separate e-mail that health care providers involved in mergers usually make promises about increases in efficiency. “The only thing that ever seems to bear out in reality is higher prices for patients,” Buck said.